Rescuers search for survivors from the Nairobi building collapse. 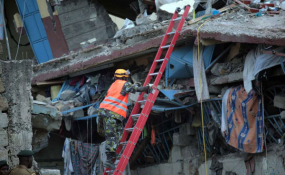 Nairobi — The death toll from the collapsed Kware building has rises to two after a woman rescued from the rubble succumbed and the body of a child was recovered last night. Officials said they had evacuated most residents before the building came down late Monday, but the incident has rekindled the controversy over unregulated construction in the city. The building collapsed in a poor neighbourhood near Nairobi's international airport southeast of the capital, Red Cross spokeswoman Noellah Musundi told AFP Tuesday. "The collapse was not completely unexpected, which allowed us to evacuate most of the people," Musundi said of the disaster which struck the Kware area of Mukuru Kwa Reuben, one of Nairobi's biggest slums. She said the exact number of missing was unclear but that rescuers were still searching for survivors. But later Tuesday, a senior official announced the rescue of another three survivors: a woman and two children — a girl and a boy. "All have been stabilised and evacuated to hospital... for further treatment," said Pius Masai, deputy director of the National Disaster Management Unit (NDMU). Police and local residents said the authorities were alerted on Monday after cracks appeared in the building. That prompted an urgent evacuation before it collapsed two hours later, at around 10:00 pm. "Most families cooperated and (were) evacuated safely. However, it is believed that some people may have been trapped. Rescue efforts are ongoing," said Masai. Resident Dorothy Ouko said she was worried about her 15-year-old son and 22-year-old nephew who had insisted on finishing their dinner before leaving the building. "My three other kids were out of the house when it collapsed," she said, adding that a neighbour on the sixth floor had also insisted on staying, dismissing fears the building would cave. "She was in the house with her two children and we don't know where they are now or whether they are alive." Masai said that by midday, 128 tenants had been accounted for, but it was not immediately clear how many people had been living there. The rescue operation was hampered by a lack of space and an adjacent seven-storey building that also appeared to be unstable, he added. Tenants from the neighbouring building were also evacuated, he said. Images posted on Twitter by the Kenyan Red Cross showed work to clear the rubble with the help of an excavator, with parts of the building's red roof clearly visible. A fire engine was also on site as well as a number of soldiers. Nairobi Governor Evans Kidero said the structure was built in 2007 without official approval. "It was one of the buildings that was marked for demolition, but because of issues of security we had not demolished it," he said. "House owners go to court and obtain orders and you know we cannot demolish houses that have court orders." But local residents blamed government officials. "Every time they tell us they are demolishing substandard houses. They demolish one or two and move on. We never get to hear from them until a tragedy like this occurs," said Francis Mwangi, who lives near the collapsed building. "This is all about corruption and inefficiency." Several buildings have collapsed in recent years in Nairobi and other Kenyan cities, where a property boom has seen buildings shoot up at speed, often with little regard for regulations. Such incidents have raised questions about the quality of building materials and construction standards in a country where rampant corruption has seen unscrupulous developers using bribes to avoid regulations. In April 2016, 49 people died when a six-storey building collapsed in a poor neighbourhood northeast of the capital after days of heavy rain caused floods and landslides. The building, constructed two years earlier, had been slated for demolition after being declared structurally unsound.